Indulge your guests during your next party or event with a selection of our classic party concessions! At We Bring the Party, we carry a variety of concessions and snack stations that add a fun and delicious touch to any celebration. 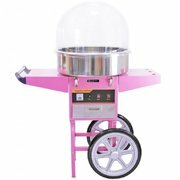 These include popcorn machines, cotton candy machines, margarita machines, sno-cone stations, and more! Every concession rental comes with everything that you need to get going, with options for additional servings when you're looking to host a particularly large event! Check out our concession rentals, as well as our other offerings such as party equipment and our various exciting inflatables to build the perfect package for your upcoming party or event!